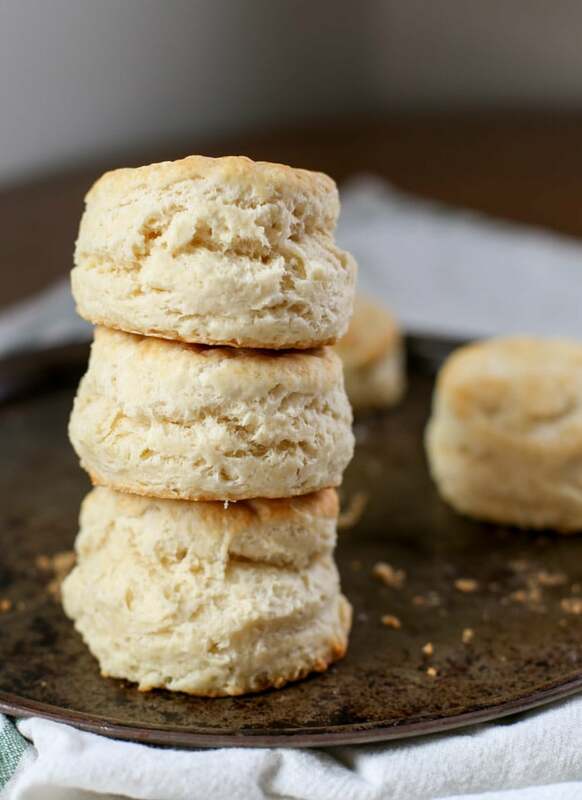 Buttery, fluffy, soft homemade biscuits from a recipe that is completely made from scratch with only six ingredients. Made from all butter and no buttermilk you have all the ingredients you need on hand to make delicious, flaky biscuits in the morning. 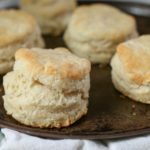 For years I tried different recipes to get the best homemade biscuits on the table for breakfast on weekends. 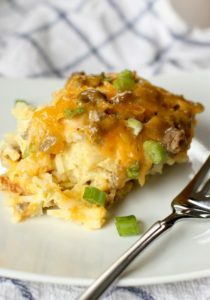 While on busy mornings I loved to make ahead these sausage and egg biscuits, when it came to the traditional homemade biscuit I was at a loss. Everything I tried failed, until I had success with making up my own recipe from trial and error. 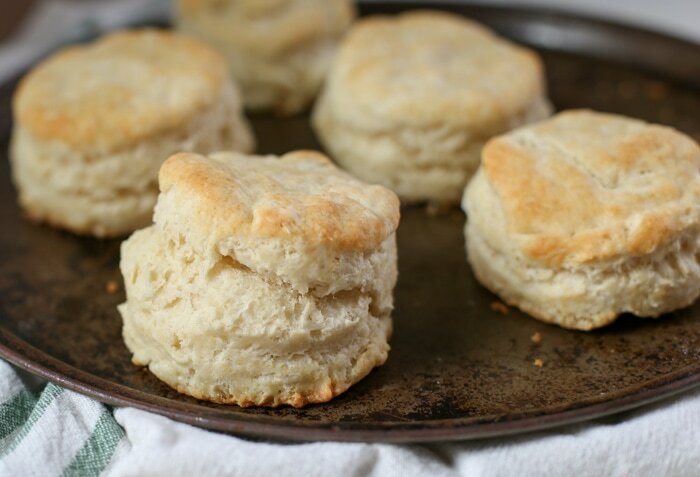 This biscuit recipe makes the best soft, but fluffy with a little bit of crunch biscuits. They are worth the effort to make them from scratch. And by effort, I mean very little of it as you can see by these simple ingredients. I make these in a half awake stupor in the morning- and they turn out great! That’s proof enough for me. Keep the butter cold. The key is paying close attention to the amount of time you handle the butter. And cold butter is key. The butter is what gives it the flakiness. Keep the butter in the refrigerator until you need. And if your biscuits are ready to bake before your oven has fully preheated, put the baking pan in the refrigerator to keep the biscuits cold until baking time. Handle the dough as little as possible. Because the butter needs to stay cold, you’ll want to handle the dough as little as possible with your hands so as not to warm the dough and melt the butter. Use more flour if needed. 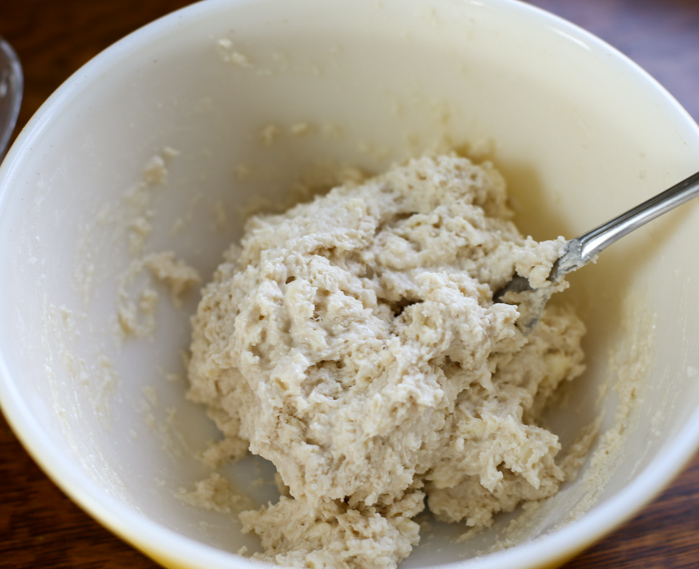 If you find the dough is a bit sticky after mixing the ingredients, use flour liberally to fold the dough so that it won’t stick to the surface. Cut in the cold butter with a pastry cutter until the butter is smaller than peas. Add the milk slowly mix until well incorporated. You can see what the dough should look like. It’s a little sticky but combined. Add the dough to a very floured surface and knead it about 10 times. No fancy kneading needed! I just fold it in half and smooooooosh it. I’m fancy like that. Flatten the dough using your hands so that it’s pretty even and about 1 inch thick. Cut the biscuit circles using a biscuit cutter. I’ve used a drinking glass for years. I purchased this biscuit cutter at an Amish Auction in addition to many other items that came in the same box. The biscuit cutter I kept and I love it. How long do I cook biscuits? Bake in a preheated 425° F oven on an un-greased pan for 12 – 15 minutes. Keep an eye on them. When they turn a nice golden brown, they are ready! This recipe makes six medium biscuits. These biscuits have the best crunch on the exterior but have that pull apart flakiness that makes them the best ever! I make these on weekends and even on weekdays now since these homemade biscuits are so easy to make! Enjoy! Can you make biscuits ahead of time? Yes. Make the biscuits and then freeze the pre-cut biscuit dough separately in the freezer. Once frozen, you can store them in an airtight container or bag in the freezer. When ready to bake, bake frozen following the baking instructions but add more baking time until they are full baked and golden brown. 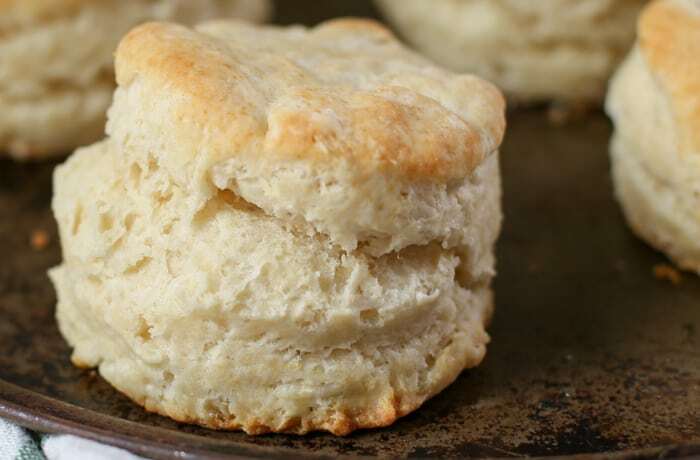 How long do homemade biscuits last? They will last at room temperature in an airtight container for 1 to 2 days. 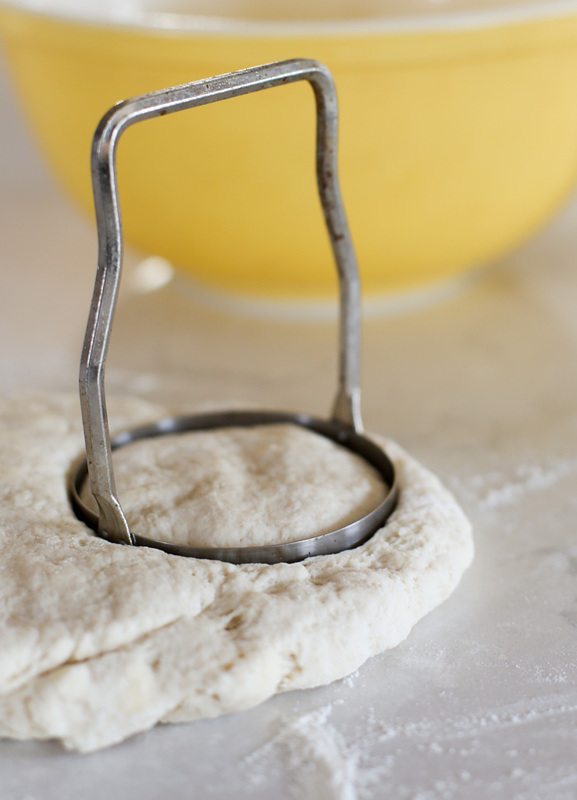 Do I need a biscuit cutter to make easy homemade biscuits? While a biscuit cutter like this one is great to have, you can use a drinking glass to cut the biscuits into shape. 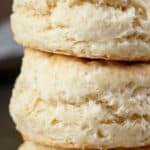 Do you use unsalted or salted butter to make biscuits? 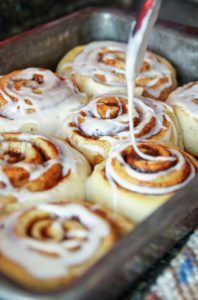 For this recipe, I use salted because that is typically what I have on hand. If using unsalted you can add 1/4 teaspoon additional salt. 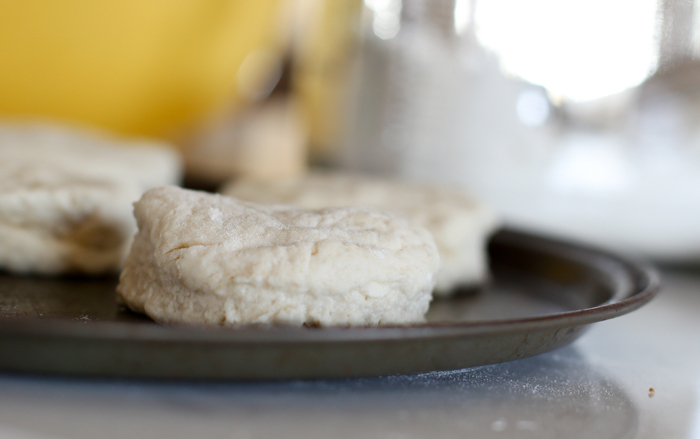 Easy homemade butter biscuits that are soft, buttery and delicious made from scratch. 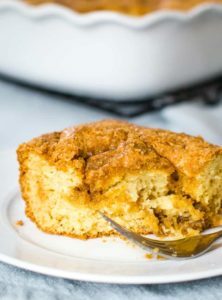 No buttermilk needed! These flaky butter biscuits are the best you will ever make! Combine dry ingredients in bowl. Cut in the cold butter until resembles small peas. Slowly add 3/4 Cup of milk and mix with fork until dough is just slightly sticky. Use more milk if needed. 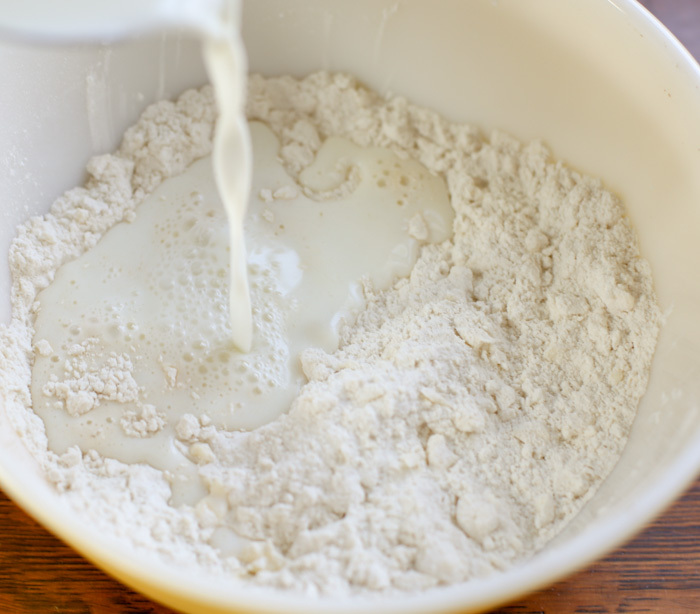 Remove dough from bowl and fold over 10 times on floured surface. Flatten the the dough using hands until about 1 inch thick. Cut biscuits using biscuit cutter. Place biscuits on un-greased dark baking pan. Bake for 12 – 15 minutes or until golden brown. Before adding butter to dry ingredients, cut into small cubes to make cutting in the butter easier and faster. If making the biscuits ahead of time, you can cut out the individual biscuits and freeze them separately. Once frozen, store in an airtight container in the freezer. Bake frozen when ready following the same baking instructions but adding additional time. 1 1/4 tsp of salt because I use only no salt butter. They are Wonderful. Yay! I’m so glad you enjoyed them. They’re our favorite as well. These are the BEST biscuits I’ve ever made. Soft and flaky on the inside. The only ones I will ever make in the future. Yay! Just made them again myself yesterday. 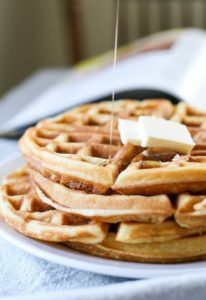 I love how easy they are and my kids love the taste. Thanks for sharing! check your recipe for classic biscuits. It says to mix the milk into the dough with a “fox”. Thank you for letting me know. 😂 You will definitely want to stir with a fork and not a fox.